2018 was a year of challenges for UIC United Faculty, and indeed, unions around the United States. From dealing with the Janus decision in the US Supreme Court, to engaging U of I Administration in what’s turned out to be a very contentious contract bargaining process, there has been plenty to keep our union members on their toes. We can, however, proudly say that we’ve tackled all of these challenges head-on, preparing for the worst, handling the bumps in the road as they came, and in many cases turning potential pitfalls into opportunities. While UICUF began 2018 with many uncertainties on the horizon, we ended the year stronger than ever. Anticipating an anti-union ruling in Janus v AFSCME last spring, we chose to act, rather than wait for the axe to fall. Over the first six months of 2018, UICUF staff and member volunteers embarked on a campaign to meet with as many members as possible. By the time the Janus ruling did arrive in late June, we had met with more than 2/3rds of our members, virtually all of whom signed recommitment cards signalling their ongoing support, regardless of the changing legal environment. Thanks in no small part to member engagement, we experienced virtually no negative membership impact from Janus, and in fact, our membership has only grown since then — a trend that shows no sign of reversing. Just because we were well prepared for the Janus decision does not mean the event passed without incident. In the immediate aftermath of the decision, we found that UIC Payroll, and U of I Labor Relations had chosen to ignore months of meetings and advanced notices meant to keep their records of dues payers updated and accurate. Instead of acknowledging our updated lists and valid membership cards, they chose to arbitrarily end dues for 145 confirmed faculty union members, not fully restoring their dues status for nearly 2 months. Others were hit much worse than we were though, and this is how UIC Unions United was formed. UIC has many unions involved on campus, but UICUF, UIC GEO, SEIU, and INA are some of the largest, representing over 8,000 workers. All of them realized after the Janus decision, that if we didn’t work together, Administration would simply continue to use the ruling as an excuse to pursue a broader union-busting agenda. Together, we formed a coalition, UIC Unions United, to push back on this agenda. Since then, we’ve demonstrated our strength through a number of actions, including a march on the Labor Relations office, a demonstration at the Board of Trustees meeting in November, and several pickets, to show that we won’t accept unilateral moves by the Administration to disenfranchise our members, or rewrite the terms of our contracts on their own say-so. 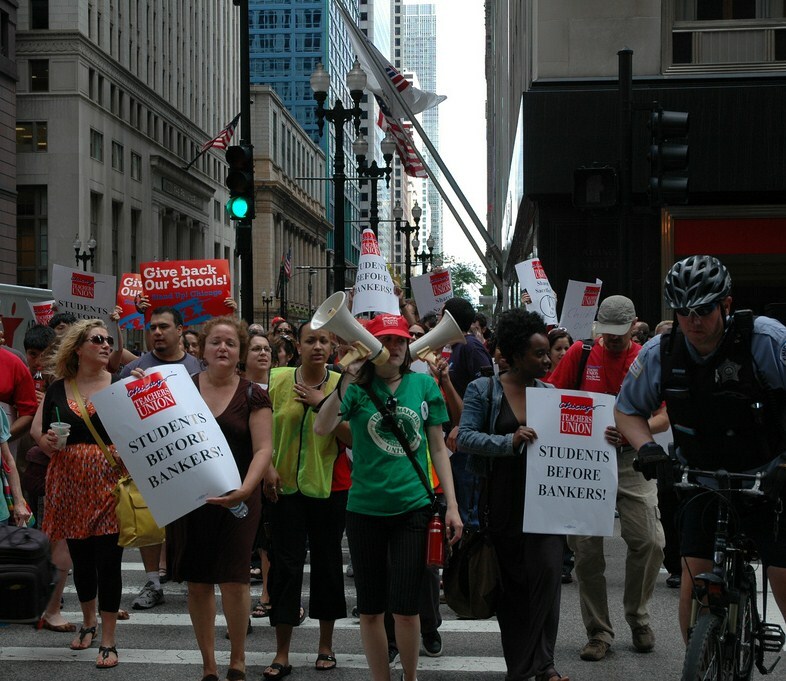 Since forming the coalition, the vast majority of members that UIC had cut from the rolls have been restored, though the university administration has done nothing to compensate the unions for these costly “errors.” More alarmingly, they still maintain that they have the right to revoke memberships at their own discretion without so much as informing the union. Every member organization of the coalition is now in the process of filing Unfair Labor Practices and/or grievances against the administration over these claims. We’re sure to see more of this play out in 2019. Regardless of the outcome, we all agree we are much stronger for having come together, even if it took difficult circumstances to galvanize us. 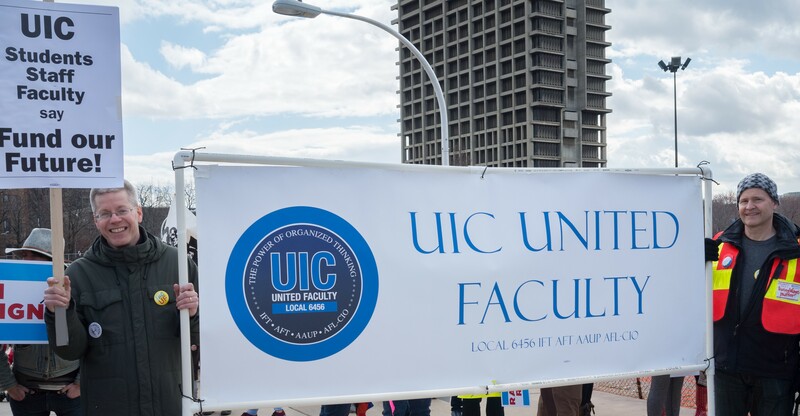 UICUF’s contract was set to expire in August of 2018. Long in advance of that date, we had convened a group of faculty from nearly every college at UIC to prepare for contract bargaining. In the fall of 2017, we polled faculty to learn what they felt were the most pressing issues of the day, and planned for months on how to turn the results into proposals that could make it into a final contract. In May, the Bargaining Committee presented a demand to bargain, and in June, contract negotiations began in earnest. Or at least they appeared to. What we quickly learned was that the negotiator assigned by U of I Administration had no interest in discussing, well, much of anything really. We presented our non-economic issues first. While there was feedback and even requests for re-writes, few counter-proposals were offered. At the same time, they held back campus wage pools, falsely claiming that it was the union’s fault. To be clear, if they truly wished to give out raises, labor law offers several commonly accepted avenues to do so, with the unions permission, which would have been given if sought. They chose not seek that permission, or even bring up the issue in negotiations beforehand, depriving us the opportunity to proactively offer it. Since June, we’ve faithfully returned to the bargaining table, despite the growing evidence that the administration does not seem interested in negotiating, so much as dictating terms. Thus, we ended 2018’s bargaining sessions with dozens of faculty in the room, while members testified as to their disappointment in Administration’s disingenuous tactics, and the time wasted while they try to avoid serious negotiations. Discussion became heated, but we did conclude with a note of hope for 2019. When next we meet, we expect U of I’s negotiating team to honor their verbal commitment to return with written counterproposals for at least one of our proposed articles. It’s not much, but even incremental improvements are worth pursuing at this stage. With each effort that fails to bring us closer to a viable contract, tensions between the union and the administration will only rise. While we hope Administration will return to the table in 2019 willing to take seriously our full set of proposals, we are also anticipating the need to significantly increase our visibility beyond the bargaining table. 2018 brought many challenges before the union, some of which are yet ongoing. 2019 is likely to bring more still, but we are ready to rise to the occasion, thanks to the support of our dedicated members and activists, and our allies on and off campus. We do not yet have new bargaining dates set, but we do know that the U of I Board of Trustees will return to Chicago for a meeting on January 31st. We will continue to keep you informed of every opportunity for you to represent yourselves and your colleagues under the union banner. Until we win a fair contract, we will be issuing periodic updates via email, Facebook, Twitter, YouTube, and here on our website. We strongly encourage everyone to like and follow us on social media. With your support, we can make UIC an even better place to work and learn! As this is an off-week from our contract bargaining efforts, we won’t be reporting on new progress in that realm, as such. However, our union of full-time faculty here at UIC doesn’t exist solely to bargain and enforce contracts. At its core, UIC United Faculty is about the people who power the university with their labor, and critically, about letting their voices be heard. We expect to share more of these videos in the future, because working at Chicago’s premier public university is more than just a job. Faculty at UIC do more than just lecture. They create the learning environment for their students, and we think that the pride and passion they pour into their work speaks for itself! If you enjoy the video, and want to see more, please subscribe to our YouTube channel so you’ll see new content as it is released. If you are a faculty member and want to tell us about how you Heart UIC, email us at UICUnitedFaculty@gmail.com. The last bargaining session of the semester is coming up next Monday, 12/17, from 1-4pm at Student Center East, in the White Oak Room. Among other discussions, we will be hearing from more of faculty members, arguing for respect in the face of an administration that, so far, refuses to acknowledge the true value of their labor. We hope you’ll join us in observing the proceedings. UIC faculty Heart UIC, and that commitment deserves recognition. A fair contract would certainly be a good start in that direction. Be it finally resolved that we will do all we can to educate our members and our entire campus community, our neighborhoods, families and friends on the critical importance of the teachers’ fight, alongside of our own fight to defend state workers and save our state universities—An Injury to One is an Injury to All. 21 Nov UIC Unions Unite! 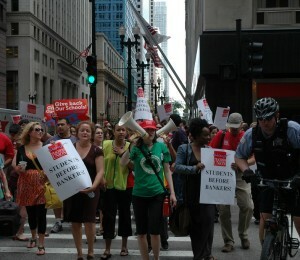 Faculty, grad students, nurses and service employees rally to show U of I’s Board what UIC Unions United looks like. Over 100 members from four campus unions joined together in protest at U of I’s Board of Trustees meeting last Thursday. UIC UF, GEO, INA, and SEIU — representing more than 8,000 UIC workers — all came together in this unprecedented display of solidarity, to demonstrate against Rauner-Era union busting tactics being perpetuated by U of I’s administration. That union busting mentality has been the rule for many years, but is especially manifest now, in the form of brazen attacks on dues deduction post-Janus, and an equally brazen attitude toward contract negotiations. Much of the institutional rigor directed against U of I system unions can be traced back to a board with a majority of members appointed by a Governor who actively campaigned on his mission to break public sector unions. Fortunately for everyone working for the state of Illinois, Governor Rauner’s days in office are now numbered. 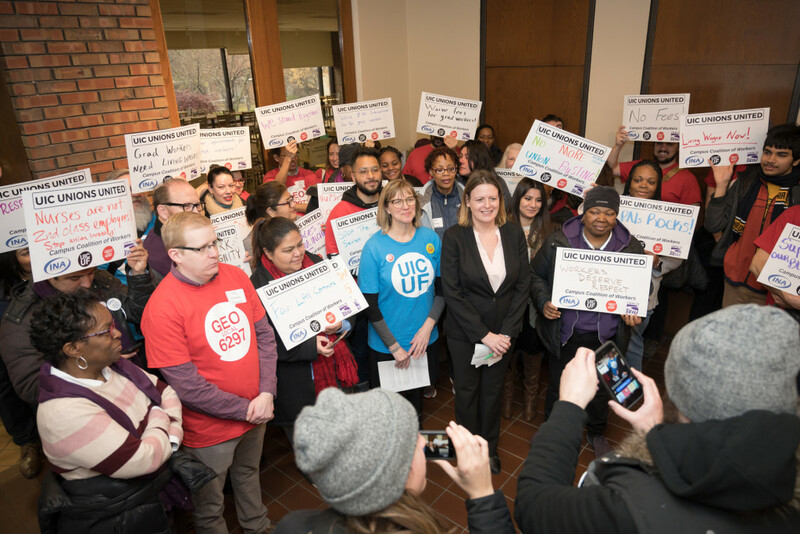 UIC’s Unions United, along with allies like recently elected Cook County Commissioner Alma Anaya, want to remind the U of I’s Board of Trustees, and their representatives in university administration, that we will soon have a new, pro-union governor. Back in July, payroll deductions for the dozens of various unions at UIC were processed as usual, except this time things were different. The Janus decision had just been released, negating prior requirements to collect fair share fees from non-union members in the bargaining unit while maintaining dues deduction for signed members. Accordingly, unions across the university sprung into action to identify all union members who should be paying dues. We did this in good faith after months of anticipation and seemingly constructive communication between the unions involved and U of I Labor Relations. Make no mistake, U of I was not taken by surprise by the Janus decision, and was given ample opportunity to ensure accurate continuity of dues deduction for signed union members. So it was a shock, though perhaps not a surprise, to find that on July 15th UIC payroll chose (or was directed) to ignore the member verifications they were being emphatically offered by the university’s unions, and cut payroll deductions in an arbitrary and opaque fashion. Though we can’t speak to the damage done to all unions in the system, the four unions representing Faculty, Grad Employees, Nurses and Service Employees, woke on July 15th to find their member roles light by hundreds of workers and their treasuries short thousands or tens of thousands of dollars in some cases. Let’s be clear, we are talking about signed union members, not fair-share fee payers here. But dues deduction is not a game. It is not optional. It is not subject to whim or interpretation. It is a right protected by law, and it is the duty of employers to honor that right by executing deductions accurately and faithfully. U of I made a mockery of this responsibility in July, and has compounded their intransigence by refusing to discuss that failure and its implications in a meaningful way ever since. UIC Unions United was formed initially to respond to this outrageous behavior, and despite attempts to engage administration on these issues, no movement has been seen. Therefore, all four unions have submitted filings of Unfair Labor Practices by U of I’s Board of Trustees and its agents. Grievances pursuant to U of I’s breach of contract in these matters are also ongoing, and will be pursued vigorously by the unions involved. Above and beyond U of I’s willful malfeasance in regard to dues deduction, our unions have been subject to less-than-collegial attitudes and tactics by administration at the bargaining table. In the most egregious case, the university’s hospital administration has railroaded the Licensed Practical Nurses at UIC and associated clinics with some of the most hostile contract language we have seen in decades. In response, the LPN’s went on strike last Thursday, and remained on strike until just yesterday, when the hospital system’s CEO agreed to step in and restore balance to the contract negotiations. All university unions are watching these proceedings with interest. We sincerely hope that U of I negotiators will not use similar tactics in the future, because work stoppages are by no means off the table for any of the unions currently bargaining contracts. While we can’t expect things to change overnight, the ouster of anti-union political leaders, and the defeat of their agendas for public sector unions, is a cause for hope. However, politicians like Governor Elect JB Pritzker, and their appointees, will need to be held accountable for those hopes to become reality. Moreover, U of I has given little to no sign of changing course on how they treat unions on their own campuses, at least not without a fight. That means that the work goes on, until all of our unions have won fair contracts, and the respect we deserve. UICUF’s contract negotiations will resume immediately after the Thanksgiving holidays, and we want to encourage everyone who is able, to attend the next bargaining session on Tuesday, Nov. 27, 10am-1pm, at Student Center East, Room 603. It is one excellent way to learn more about how the union works, and what we are facing when we meet with administration face-to-face. Even if you can’t be there, we encourage you to wear your union t-shirts and pins in solidarity with our bargaining team on Tuesday. Until we win a fair contract, we will be issuing periodic updates via email, facebook, twitter, and here on our website. We strongly encourage everyone to like and follow us on social media. With your support, we can make UIC an even better place to work and learn! Members of 4 UIC Unions rally against Rauner-Era union busting tactics at the Board of Trustees meeting in Chicago. 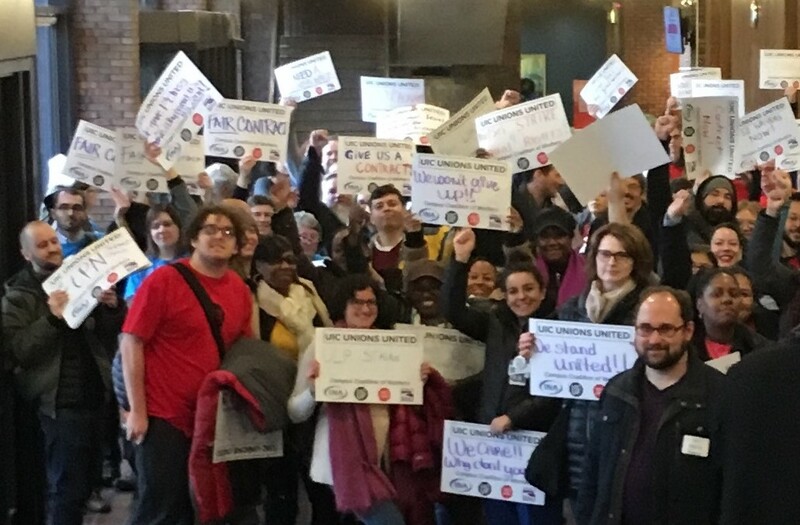 In a powerful display of labor unity, this morning scores of UIC workers from four campus unions gathered at the University of Illinois Board of Trustees meeting to protest the University’s recent labor law violations and to demand fair contracts. Since the Supreme Court’s Janus v. AFSCME decision this summer, the University administration has illegally attempted to implement new dues deduction processes, while simultaneously trying to impose second-rate contracts on the Licensed Practical Nurses (LPNs), faculty, and graduate student workers. Thirty-four LPNs from the UI Hospital began an indefinite strike this morning to protest these unfair labor practices and to demand a fair contract. Following Bruce Rauner’s overwhelming defeat in last week’s election, the unions are calling on the University Board of Trustees to abandon its Rauner-era anti-union, anti-worker agenda. Members of the Illinois Nurses Association (INA), SEIU Local 73, UIC United Faculty, and the UIC Graduate Employees Organization (GEO) entered the University Board of Trustees meeting this morning and silently held up signs demanding living wages, more workplace protections, and an end to illegal union busting. At a press conference immediately after this silent protest, leaders and activists from all four unions spoke. “Everyone knows that 34 primarily women of color provide some of the most hands-on direct patient care to some of the most impoverished communities in Chicago,” said Ramona Morales of the INA. “However, UIH has decided to show blatant disrespect to us and the communities we serve by demanding we accept a second-class contract with watered-down or non-existent protections.” Morales is an LPN in Outpatient Dialysis, has worked at UI Health for 18 years, and is on strike. GEO, United Faculty, and the LPNs have been in contract negotiations with the University for the past several months. The bargaining units represented by SEIU Local 73, including clerical, maintenance, technical, and civil service workers, will begin contract negotiations next year. UIC faculty’s mud covered view from an office inside University Hall. When people think of unions, they often associate them with picket lines, protests, and occasionally major lawsuits. To some extent, that makes sense, as those are indeed some of the strongest actions a union can take to ensure its members’ needs are being taken seriously. But that image belies the true, day-to-day realities of having a union presence in your workplace. First and foremost, a union is a community. In particular, it is a community that allows its members to discuss shared workplace issues, and address them as a united group, rather than as isolated individuals. When union members act together, the results usually are not that flashy, but they are often far more effective than if people act on their own. That’s why it is even more important to share the stories of everyday union victories in the workplace. Most labor actions won’t change the world overnight, but they very well might protect you from unsafe working conditions, or ensure that your boss thinks twice about making inappropriate comments in a staff meeting. To highlight the fact that workers get taken more seriously when working together as a union, we have only to look back to a recent example: fallout from construction being done at University Hall. If you’ve been around UIC lately, you may have noticed some construction going on. While construction on a university campus may be common, and necessary, it can still create major disruptions in the lives of faculty and students, especially when those faculty and students aren’t consulted or listened to. In this case, the ongoing construction has caused a range of problems, from dust and particulate filling offices, to unbearable fumes, to major leaks in the facade which allowed muddy water to flow in, leaving stains and rot in its wake. The resulting mess was not only an eyesore, but a potential safety hazard. Yet when individual faculty complained, or asked the university how things would be cleaned up in the aftermath, UIC officials seemed to offer few assurances. After hearing this story, and many others over the course of the construction, UIC United Faculty began to take action. The rumbling began at the grassroots, with members raising the alarm, and inviting other colleagues to share their stories. Before long, it was quite clear that this problem was widespread and in some cases quite serious. When approached by the union with the collected testimony of so many faculty behind them, UIC officials changed their tune. They were immediately more helpful and responsive, saying they would take action to remedy the situation. And to some extent, at least, that’s what happened. With the union facilitating the identification of problem areas, the fumes and much of the rot from the leaks was, in fact, dealt with expediently. Unfortunately, despite an initial good start to the work, as problems continued to mount, and the most serious issues were addressed, administration’s desire to follow through seemed to once again slacken. In particular, the administration appeared to be unconcerned about finalizing repairs of leaks, and were especially dismissive of cleaning up the mess they’d left behind. Repeated demands for answers, both by individuals and the union, were met with unhelpful commentary about how the contractors would be responsible for cleanup, or how the impact of the leaks was minor and limited to small sections of the building. 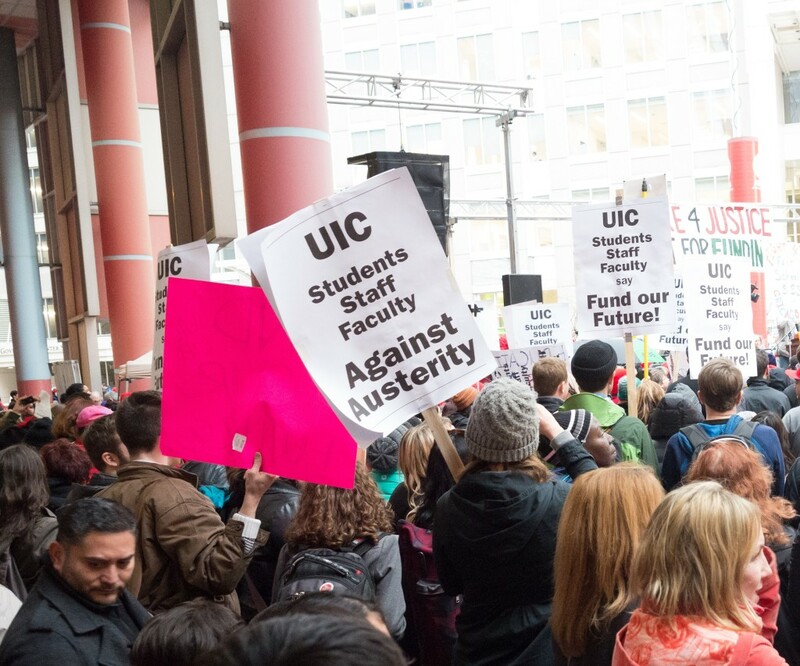 The accompanying reassurances by administration, that issues would be dealt with, were largely devoid of critical details, leaving some faculty feeling that UIC Administration wasn’t taking the remaining concerns seriously. UIC officials ignored further inquiries for weeks. Only after union representatives actually accompanied inspectors to document the degraded working conditions caused by the construction, did things really change. 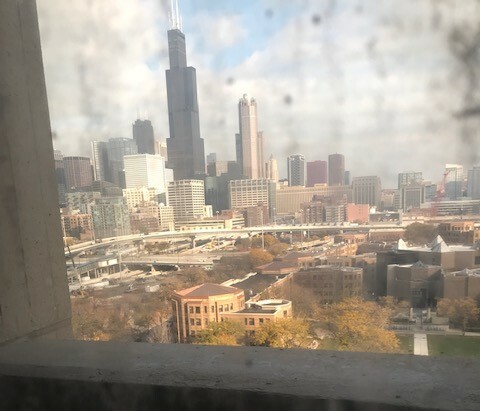 In a shocking coincidence, days later, UIC officials emailed those working in University Hall to assure them that cleaning was being scheduled, and to give detailed instructions on how to set up work for individual offices. As you can see, many things can be accomplished with the simple persistence and creativity of union members working together. But sometimes bigger efforts ARE necessary. Tomorrow is one of those times. Given the overall slow progress of contract negotiations so far, we feel compelled to raise our concerns in front of a larger audience. Tomorrow, November 15th, the U of I Board of Trustees will be at Student Center West for one of their rare Chicago meetings. We, alongside our fellow UIC unions, will hold a rally and press conference to show the Board that we will not stand by and be railroaded with a take-it-or-leave-it contract. We will also be joining our fellow workers in the Licensed Practical Nurses bargaining unit of the Illinois Nurses Association, who will be going on strike for their own contract the same day. We will gather in the south lobby of Student Center West at 9:30am, and will hold a press conference later that morning. We highly encourage our members and allies to attend one or both of these events tomorrow. If you are able to join us, please RSVP to UICUFJeff@gmail.com. If you’re a faculty member at UIC, your union needs you! We are currently engaged in increasingly tough negotiations over our next contract, and the strength and involvement of our membership will be a decisive factor in achieving success in those negotiations. To remind folks what’s at stake, U of I Administration has yet to agree to anything not already in our previous contract, despite 4 months of negotiation, 9 rounds of meetings, and the presentation of 16 proposals that would cost them little or nothing to implement. We have no reason to believe they’ll give proposals for long-awaited pay raises a more favorable reception. Since the Administration has clearly signaled that they have no intention of engaging in constructive discussion, it seems that further action will be necessary to reach an agreement that addresses faculty concerns. Here are a few ways you can get involved in the coming weeks and months, to help us push for a contract that improves working and learning conditions at UIC AND keeps faculty financially secure in the face of rising inflation and local costs-of-living. It’s an obvious one, but if you’re not a union member, joining the union is the first step toward helping us build power, and leverage toward a better contract. Every new member is a reminder to the Administration that our bargaining team represents a unified faculty. 2/3rds of all eligible faculty are already members, and joining is easy. Visit our membership page now to complete an application! Knowledge is power, and we try to keep our members as informed as possible about union activities. In addition to our regular updates here on the website, members receive weekly email updates, and you can get even more timely info about union activities by following us on Facebook and Twitter. Every bargaining day is an opportunity to show your solidarity by wearing your union colors. Let your colleagues, and U of I Administration, know that you support your bargaining team with a strong showing of your union blues. Members can request free t-shirts and pins if you don’t already have them, by emailing us at UICUnitedfaculty@gmail.com. We periodically issue surveys to learn more about our members’ priorities. A bargaining priority survey is live RIGHT NOW, and if you’re a member, you should take 3 minutes to complete it. If you did not receive a link to the survey via email, contact us at UICUnitedFaculty@gmail.com for a new one. Running a union that’s responsive to members and effective in engaging university administration takes a lot of work, but many hands makes that work much easier! Serving on a committee, acting as a communicator for your department, or running for an elected position are all great ways to make our union more effective. If you want to learn more about volunteer opportunities, let us know at UICUnitedFaculty@gmail.com. As contract negotiations unfold, we want to personally encourage you to be an active participant in our union, and the bargaining process. Everyone in our bargaining unit has a stake in these negotiations, and our strong membership is our greatest leverage at that table. If you’re a faculty member at UIC, you may have heard that the reason all faculty in our bargaining unit (union member or not) did not see a merit raise in their Notice of Appointment is because the union is negotiating our next contract. I want to assure you that is not actually the case. This was the U of I administration’s choice, not UICUF’s. Labor law clearly allows for agreements on pay increases during contract negotiations, and the union would have been happy to consider such an interim agreement had one been presented. 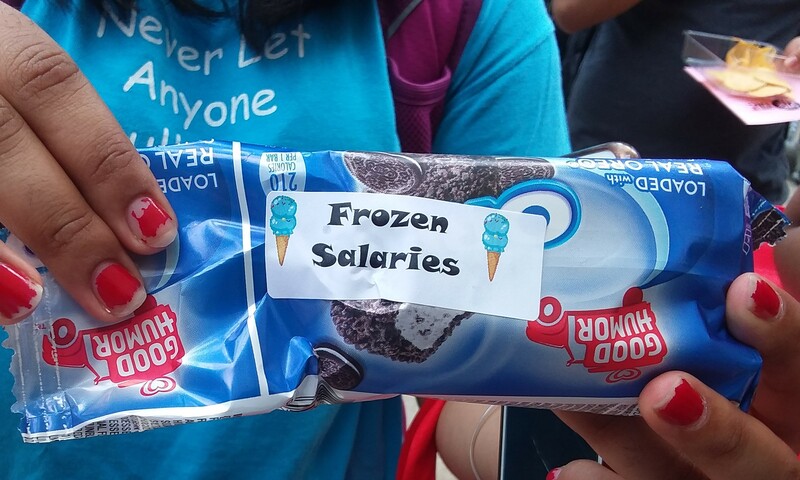 I also want to assure you that UICUF will seek salary pools for merit as well as compression and equity in our new contract, and make sure raises are retroactive back to 8-16-18. However, we will not support any proposals that leave you with less earning potential than you had last year. To this end, we must point out that the 2% campus wage pool offered this year is downright insufficient when inflation is expected to be closer to 3%. To ensure that U of I administration does the right thing, we are going to need to work together. Our Member Meeting Wednesday, October 10th, 3:30-5pm at Hull House, is a great opportunity to learn more about the negotiations, give input, and get involved. However, you must be a member to attend! If you are not yet a member of the union, you can join by downloading an application, or you can complete one when you arrive at the Member Meeting. Members enjoy many benefits and privileges, including regular updates on the bargaining process as it unfolds and voting on the final contract. If you are already a member, the easiest way to support the union is to wear your UIC United Faculty T-shirts and pins on bargaining days, and come to observe the bargaining sessions as your schedule allows (next one is Tuesday, 10/9, 12-3pm @SCE, White Oak Room). Please let our organizer, Jeff Edwards, know about your plans to attend by emailing him at UICUFJeff@gmail.com. You can get union gear at the Member Meeting or by sending us a request at UICUnitedFaculty@gmail.com. You are the union! As contract negotiations unfold, I want to personally encourage you to be an active participant in our union, and the bargaining process. Everyone in our bargaining unit has a stake in these negotiations, and our strong membership is our greatest leverage at that table. We look forward to seeing you at bargaining, and at the Member Meeting next Wednesday! Tuesday, 10/9: Bargaining session #9. Wear your t-shirts and buttons on campus! Wednesday, 10/10: Member Meeting, 3:30-5pm Hull House Dining Hall. Contract presentation by the Bargaining Team. Tuesday, 10/23: Bargaining session #10. Wear your t-shirts and buttons on campus! Wednesday, 11/7: Rep Assembly meeting 11-12:30pm, UH 2028. All members invited. Thursday, 11/15: Board of Trustees meeting in Chicago. 20 Sep Elections Edition: Take Action, Get Registered, Vote! For a long time now, public education, and the workers who serve the public as teachers, faculty, counselors, etc. have been under political siege. We have been subject to stalled or slashed budgets, cuts to programs, personnel, and basic classroom resources, and have steadily been in the crosshairs of privatization advocates who want to run schools as (profitable) businesses. Yet it has become an all too mainstream narrative that it’s the educators serving our students who are selfish, lazy, and getting rich by draining the public coffers. The recent wave of teacher uprisings have won substantial gains for public education as a whole, using many time-honored tools from the community organizing playbook, including public advocacy, work stoppages, and electoral activism. We’ve also seen an unprecedented wave of educators signing up as political candidates across the country. Educators and communities are fed up, and increasingly fighting to shift the political momentum toward supporting public education instead of degrading and defunding it. We need you to join us in that fight! Given the significant impact that politics can have on public education, we want to remind everyone that national elections are right around the corner, and voter registration deadlines are coming even sooner. There are also a number of opportunities to register in person on campus. Next week, the Civic Engagement Committee of UIC will be hosting National Voter Registration Day events in the quad. You can show up any time from 11-1pm, Tuesday, Sept. 25th. Come make sure you’re registered and ready to vote, in what promises to be a pivotal election for higher education issues in the state of Illinois, and the nation. If you haven’t gotten around to registering, or updating your registration with your current address, now is the time! We also want to remind all of our members that UIC United Faculty has started an independent political fund to support candidates that support public higher education. Union dues never go toward funding political campaigns, but we clearly have a critical interest in supporting candidates who value public education. Even small contributions help, and faculty members working to educate the public on political issues goes a long way toward promoting a vision of higher education of which we can all be proud. If you want to become a contributor to our newly formed Committee On Political Education (COPE) fund, or want to get involved with the committee’s work, email us at UICUnitedFaculty@gmail.com. Our next contract bargaining session is September 27th. We are asking all our members to wear their UICUF T-shirts and pins that day to show solidarity and support for our bargaining team at the table. 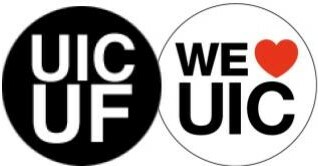 If you are a member and need a T-shirt, pin, or other UICUF materials, email us at UICUnitedFaculty@gmail.com. In recognition of our shared interests in fair compensation for our labor and access to education, among other concerns, the faculty union of the University of Illinois at Chicago (UIC), UIC United Faculty Local 6456, offers this letter of solidarity to all incarcerated peoples participating in the 2018 National Prison Strike and the supporting organizations of Jailhouse Lawyers Speak, Millions for Prisoners Human Rights, IWOC, and others. In alignment with our mission and that of our land grant university, UIC United Faculty believes that access to public education is central to social justice, and we stand in support with those striking for their right to education. 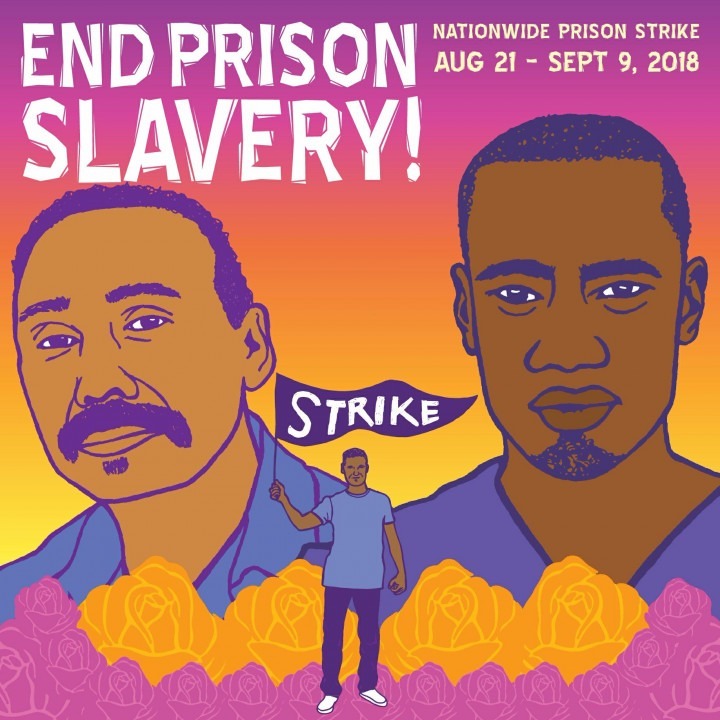 Further, we fully support the demands of the strikers and the work of the organizing bodies of the Prison Strike, and stand in solidarity with incarcerated people everywhere as they seek to gain fair wages for their labor. We reject any policies which deny people their basic human rights, and believe everyone has the right to demand equitable treatment. Standing firmly on the side of justice, UIC United Faculty is proud to endorse the National Prison Strike, and pledge our support.